STIDCOTE HOUSE - the missing property? Francis Watts owned Stidcote House in 1651 and it is likely that John Cullimore occupied it at that time. Later it was owned by Richard Watts who also owned Bishop’s Farm. Sir Robert Atkyns in his book ' The Ancient and Present State of Glostershire’ written in 1712 states that there were four families living at Stidcot in his day. This suggests that there were four separate households. Today, however, there are only three, Pendick's Farm, Summerleaze and Stidcot Farm. Where was the fourth? 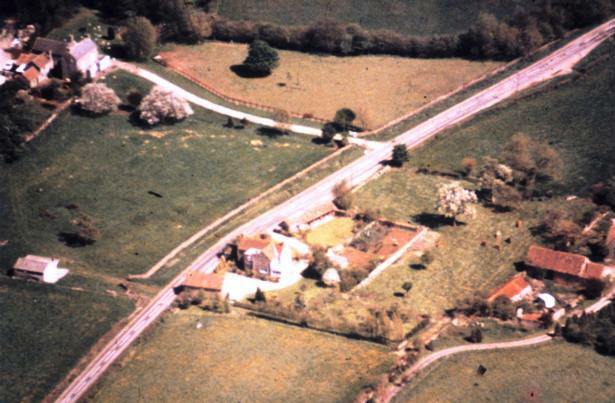 The photograph below shows Summerleaze Farm in the centre with Pendicks Farm on the right and Stidcot Farm to the left. There are in the possession of Mr. Robert Willcox of Stidcote Farm a number of 18th century deeds which refer to a certain Stidcote House, and land belonging to it, which appear to be distinct from Stidcote Farm. The property consisted of a house together with one close called Home Close of 6 acres and two other closes called Upper Field Close and Lower Field Close which were formerly one close called Stitcott’s Field of 5 acres. In 1737 the house was said to be " now a ruin and demolished." In 1758 Thomas Russel of Stidcutt (Pendicks) leased the Home Close (Otherwise Stidcutt's Close) from Elizabeth CulIimore (widow) of Stidcutt (Summerleaze?) but in 1761 he assigned the remainder of the lease to Isaac Parker of Stidcutt (Stidcote Farm) for the sum of £30, having first made an agreement that he should be at liberty at any time to enter the premises to dig and take away all or any of the rubble from the ruined house. It was about this time that alterations were made to Summerleaze since a coin of 1767 was found over the lintel of the front door during renovations in 1967. In the field across the road from the entrance to Summerleaze there are irregularities in the ground surface which seem to indicate the former existence of some structure at this spot. In fact during the widening of the road in 19?? part of this area was cut into and fragments of debris from a habitation could be seen in the side of the new ditch which was cut at the side of the road. It is quite likely that this was the site of Stidcote House, and would indeed have been most handy as a quarry for stone for Summerleaze. The history of the property can be reconstructed for most of the 18th century from the deeds at Stidcote Farm. It appears that the house and lands belonged at the end of the 17th century to one Richard Watts who sold it to William Pullen. William Pullen left it to be divided between his three sons John, William and James but John and James relinquished their claims to it in favour of William. This William Pullen is described as a clothier and in his will dated June 10th 1714 left the property together with other lands to his wife Mary and her heirs. Mary subsequently married John Bromwich of Tytherington but she was again widowed by 1721. In 1720 she assigned Stittcutt House in trust for Richard Giles her son-in-law, but in 1721 she sold it to him for £60. Richard Giles is described as a gentleman of Kington, and had married Ann, daughter of Mary Bromwich by her first husband William Pullen. Richard Giles in his will left the property to his daughters Sarah and Mary, subject to the payment of a legacy of £50 charged on the premises to William their brother. Sarah married John Foscott and at her sister Mary's death became entitled to the whole property subject to the payment of the legacy to her brother. John Foscott is described as a haberdasher of hats in Bristol. In 1737 Stidcot House (now a ruin and demolished ) together with Stitcott Close (formerly the Home Close) and the Lower and Upper Field were sold to John Horwood of Grovesend, yeoman, for the sum of £170 plus £50 to William Giles, being the inheritance due to him by his father's will. In 1757 John Horwood left the Stidcot property in his will to his daughter Sarah and died the following year. Sarah in her will of 1758 left the ruined house and Standout’s Close which was then being rented by Isaac Parker of Stidcot Farm, to Elizabeth Cullimore of Stidcot for the rest of her life and after her death to her mother Mrs. Hester Horwood and her Aunt Sarah James and then to the heirs of the survivor of them. The Upper and Lower Fields (formerly Stidcutt's fields) she left to Timothy Roach junior together with all piece or parcel of ground in Tytherington's mead. The Upper and Lower fields were at that time being rented by John and Robert Duck (they were later known as Duck's villes, probably a corruption of Duck's Fields) and the part of Tytherington's Mead) by Samuel Gerrish. John Horwood died on August 16th 1758 and his daughter Sarah having made her will on August 27th died not long after. Elizabeth Cullimore, who was a widow, immediately leased the property she had inherited to Thomas Russel for £10 and he in 1761 sold the remainder of the lease to Isaac Parker for £30. In 1761 Hester Horwood made a covenant with her nephew Daniel Holbrow of Itchington to leave him the ruins and close at Stidcot with other lands, but she was to have the use of them for her life. This grant was confirmed in her will made on October 9th 1764 at which time both she and her nephew were living at Tockington. Hester Horwood died March 28th 1765. In 1776 Daniel Holbrow, then living in Bristol sold the ruins and Stidcutt Close to Samuel Gerrish of Downend, a surgeon and apothecary, for the sum of £210. In 1777, Samuel Gerrish who was then living in Market Lavington Wilts. sold the property to Isaac Parker for £231 and since then it has been part of Stidcote Farm. In 1781 John Russell of Itchington, gentleman, rented the Upper and Lower Fields formerly called Stidcutt's field, from Timothy Roach junior and his wife Sarah, and also the piece of ground in Tytherington Mead formerly rented by Samuel Gerrish which seems to have gone by the name of Sainsbury's Mead. Presumably these lands are included in the agreement in court between Martha Smith, widow, and Timothy Roach and Sarah his wife made in 1790 concerning seven acres of land, seven acres of meadow and seven acres of pasture and common of pasture in the parish of Tytherington whereby Timothy and Sarah acknowledged the property to be the right of Martha as those of which she had as the gift of Timothy and Sarah and which they quit claimed for the sum of £60. Sarah Roach appears to have been the sister-in-law of Martha Smith, who was the widow of her late brother John Smith. There is no further mention of transactions concerning these lands but presumably they were finally inherited by or sold to Issac and Martha Parker or their daughter Mary Ann Drew, or her grandson Isaac Parker-Drew, for the land was later included in that of Stidcote Farm, and the deeds are kept there.